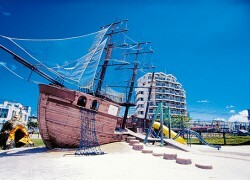 Situated in Araha Park's lawn area, this is a playground structure modeled after the Indian Oak -- a British sailing ship that ran aground on the shores of Chatan in 1840. It's said that all 67 crewmembers of the ship were rescued by the local residents, who then helped rebuild the ship, allowing the crew to sail home safely. Erected right next to the structure is a monument to the hospitality and warmhearted nature of the residents of the day.